Working in the zoo and aquarium industry offers a lot of perks. That’s because we get to work with some of the coolest animals in the world. As I was walking through the exhibits looking at what our guests see, I started counting the species of sharks and rays we house at Moody Gardens® and the diversity they represent in habitat, diet, behavior and natural history. From the secretive swell sharks and wobbegongs to the large active brown sharks and sand tigers, we have 22 species from Galveston’s local waters to Australian reefs from the other side of the world. We have three species of stingrays that are found in the Amazon River basin and are so completely adapted to living in freshwater that they can’t exist in the brackish delta. One of the questions we answer while walking through the public galleries is, “Where are the sharks?” Over time we’ve come to realize that most guests are referring to the Caribbean exhibit and the large, easily recognizable species. You might be surprised to hear that four out of these five are relatively common species in the waters just off Galveston. If they truly were the bloodthirsty human predators they’re portrayed to be, we surely would be losing more tourists and fishermen to the sharky menace.Looking at the tremendous diversity of sharks, rays, skates, guitarfish, sawsharks and sawfish all collectively grouped together as cartilaginous fishes, there are over 1,200 different species. The sharks that gain all of the attention are the ones that grab the headlines in “attacks” on humans, and the five that are generally agreed upon as the top “maneaters” are – great hammerhead, lemon, bull, tiger and white sharks. In reality, the vast majority of the 100 incidents that are reported worldwide annually are cases of mistaken identity with small, non-dangerous species. Contrast those statistics with the estimated 350 to 500 million sharks that are removed from the world’s oceans every year. Many of those are reproductively mature adults of species that are in perilous population declines and in some cases, they have their fins cut off and are dumped back into the water to die. 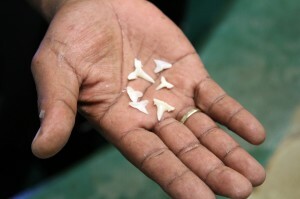 Even if you don’t particularly like sharks, you have to see how wasteful shark finning is. Back to the amazing diversity – whale sharks are the largest fish with a maximum length of 45 feet and weighing as much as 36 tons. Along with basking sharks and megamouth sharks as the most menacing-sized sharks, they all filter feed on plankton and small fish. On the opposite end of the spectrum, the tiny cigar shark reaches a maximum size of only about eight inches long. The biggest ray species is the manta which can have wing tips that measure almost 24 feet wide and weigh almost 3,000 pounds. Electric rays generate powerful electric currents that protect them from predators and assist in navigating dark murky water and capturing prey. 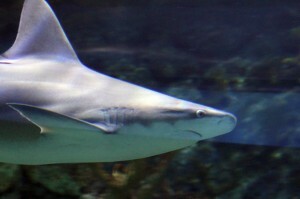 Between sharks and rays is an assortment of species that have aspects of their appearance that match both – a generally flattened body with elongated tails. These include angel sharks, guitarfish, sawsharks and sawfish. 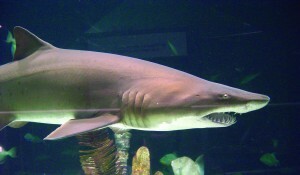 Sharks can fill ecological niches from scavengers to apex predators and have reproductive strategies that include eggs deposited within the reef to complex internal egg incubation, internal hatching and internal cannibalism of siblings. From this rambling account, you hopefully have gained enough perspective to realize that “sharks” cannot be painted with a simple broad brush stroke. They generally all came from ancient ancestors hundreds of millions of years ago. They fill every available niche and are remarkably adaptable to environmental changes and pressures placed on them. For every species we can provide care for in the captive aquarium, there are dozens of other species that we simply don’t know enough about. It’s a safe wager that there are untold numbers of species out there that we haven’t even discovered yet.